THEODORE AUSTIN-SPARKS, best known as TAS to those of us who knew and loved him, was a preacher and teacher who lived and worked for most of his life in the Forest Hill District of southeast London, England. With a high view of the Bible as the word of God, coupled with an exceptional ability to draw out its secrets, he profoundly influenced many lives and left a legacy of proven Spirit-anointed ministry that continues, in new ways, to challenge and inspire Christians today. TAS was born into a London family group of which only his mother was a believer, and when he was sent away from her influence to his father's relatives in Scotland, his school years became very lonely. Christian life for Theo began there, on a street in Glasgow, in 1906. He was 17 at the time and his attention was arrested by some young people who were sharing their Christian experience in an open air meeting. Before the day was over he had committed his life to Christ. Within a short time he was giving his personal testimony alongside the same group of young people. He returned to London soon after his conversion and became involved in the life of the evangelical community there. When the Torrey-Alexander Missionary team came to London to hold meetings in the Albert Hall, Theo gave them enthusiastic support. Unfortunately, his interests and activities were met with disapproval and strong opposition from his father, to the point where he had to leave home and find his way in life without parental help. The British evangelical community at this time was being influenced by a remarkable revival that broke out in Wales in the years 1904 and 1905. Whole communities, not just individuals, anxiously sought salvation. About 100,000 professed conversion, and many felt that they were experiencing the dynamic of the first century church. Evan Roberts, of the Calvinistic Methodist Church, underwent a vivid spiritual experience that made him the central figure of the revival. Later, in 1912, he described his experiences in a book written jointly with Jessie Penn-Lewis, War on the Saints, in which the necessity of a baptism in the Holy Spirit was stressed. Only thus, it was claimed, could the Christian enjoy triumphant living. The Welsh Revival was followed by other widespread and multifaceted movements that similarly focused on a deeper experience of the Holy Spirit. Many were divisive. David Bebbington, in his classic work Evangelicalism in Modern Britain: A History from the 1730s to the 1980s, dates these movements, with their emphases on a deeper life in Christ, as extending from 1904 to the latter part of the 1920s. Such were the times in which TAS matured and labored in his early years of ministry. Many of those he admired or with whom he associated, Oswald Chambers, F.B. Meyer, Jessie Penn-Lewis, and A.J. Gordon and A.B. Simpson in the United States, were very much involved in one or more of these 'deeper life' movements. They or their writings helped to shape TAS' thinking and to develop a vision that, in its mature form, he would describe as "A ministry to all saints so that they might enjoy a fuller measure of Christ, a richer and higher level of spiritual life, and thus help to bring the Church closer to God's will for it." From 1912 to 1926 he was pastor in turn of three established churches in the Greater London area, one Congregational and two Baptist Union. During that period he was often invited to speak elsewhere in Britain. In 1926 he felt led to step aside from pastoral work in order to establish, along with like-minded colleagues, a Christian fellowship and conference centre in Forest Hill, London, dedicated to the deepening of believers' walk with God. The new centre had a guest house and additional rooms where, under TAS' ministry, believers met regularly and where he himself was almost continually involved. 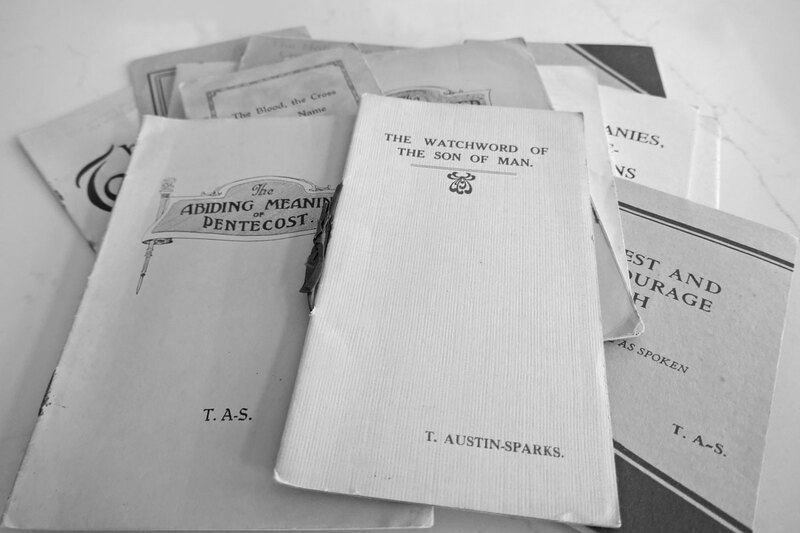 A periodical, titled A Witness and a Testimony, editor T. Austin-Sparks, had been launched at his previous pastorate, Honor Oak Baptist Church. It was published six times a year and now served to distribute messages to a wider audience. In speaking of contributors he would say "Witness" is the person and "Testimony" what is proclaimed. TAS' influence expanded greatly at the new centre. People came from afar, attracted to his rich ministry and to that of his several gifted associates. Many stayed for extended periods of fellowship and instruction, some at the centre, others later in Kilcreggan, Scotland, or West Watch in southern England, two retreats that were associated with the Forest Hill centre. Residential Bible courses of the kind that are difficult in a church setting became common features of these places. As the centre became more widely known people tended to identify it by the name of the road on which it was situated, "Honor Oak." From time to time those whose lives had been enriched by their contacts with the fellowship centre moved on to mission fields in different parts of the world. Invitations to speak came to TAS from several countries, notably the United States. It was not long before the centre bore the marks of a world-minded community as God's work and servants worldwide were brought before the Lord in prayer. Besides the periodical, A Witness and a Testimony, other publications were soon added and often a book would be published as the record of a sequence of devotional conference messages on a theme. My first acquaintance with TAS was early in 1948. I had committed my life to Christ at the centre a month earlier while he was in the U.S., speaking at different places. First impressions were of an attractive personality, quite a commanding figure, tall, with a friendly smile. He was somewhat reserved in manner. You soon discovered that small talk was not for him. On occasion he would sit in silence for extended periods, oblivious to those carrying on a conversation nearby. The fellowship centre was a happy spiritual home for me. I spent three years there attending services and Bible studies, learning a fuller meaning of the Bible, the content of which was already quite familiar to me. TAS and his associates provided a foundation for my Christian life that has guided me ever since. Thinking of him, I can echo C.S. Lewis' expression of his indebtedness to George Macdonald: "He influenced me as much as any man can influence another." TAS always wanted to see the content of his teaching shared widely and freshly relayed to succeeding generations. He felt that what was given by God was intended for the whole church and never only for one time or place. That is why I have written this book. It is a selection of annotated extracts from the many books published at the centre, as a depository for future generations. Its format has been defined by a particular characteristic of TAS' own published works: almost every book, periodical, or booklet reproduced messages exactly as they were given in the spoken form. He insisted on this. For those who knew the speaker, or who had heard the messages at first hand, such an arrangement was fine. They could benefit from further reflection. It is more difficult for others who might read these publications in later years. The content of the spoken word includes voice modulation, emphasis, pauses, repetition, and body language. Written text needs to be restructured to compensate for the absence of all that. Such considerations led me to write this book as extracts highlighted by commentary rather than as an anthology of chosen passages. TAS brought certain emphases to the Christian community, aspects of historic Christianity that had either been neglected or had not received adequate coverage in the preaching and literature of his time. However, it was not just the rich content of his teaching that meant so much to listeners; rather it was the ways in which he brought Scripture to life and made it relevant and life-transforming. It was this that made the lasting impressions on the minds of those who heard him. Many of the emphases he brought have since been recovered by others; some remain as his unique contribution to evangelical thinking. One example of the latter might be the importance he gave to what I might call "God's timeless purpose in Christ," based on the book of Ephesians, defining salvation as an expression of the glory of Christ rather than an emergency rescue mission totally centred on humanity. With the possible exception of prayer this focus is the one that is most vividly remembered. Here is how one person described it many years later: "What I personally received, and did not get anywhere else, and in fact what was barely hinted at anywhere else, was this theme of the 'Grand Design,' the sense of things hanging together in the spiritual life. I learned that everything was underlaid by one single purpose and was moving toward the one single goal which God had set for himself." The deepest impressions of TAS' life and ministry came from his prayer life and its challenge to those who gathered with him at the Christian fellowship centre. Two evenings a week were given exclusively to prayer, and few areas of the world were untouched on these occasions. Of the many comments I received from people who were familiar with these meetings two will suffice to illustrate their significance: "I shall never forget the spiritual elevation and felt nearness to God on these occasions. TAS' strong intimacy with God, and his evident dependence on him, seemed to stun us. It was an unforgettable experience." "Prayer at the centre was a holy, corporate, unifying experience. Who could fail to benefit from these prayer meetings, or who could forget their power?" Additionally, the leaders and church elders at the centre devoted all day every Tuesday to prayer and fasting. There were other areas of ministry that have often been quoted as characteristic of TAS' teaching. One of these was his insistent reminder that we always need divine revelation to open up Scripture to us. That is not, of course, in terms of God's initial disclosure of truth via its authors. For us it is God's Holy Spirit here and now illuminating our hearts by that word of God given through them. Another focus was the subjective experience of the cross of Christ, going beyond forgiveness to deliverance from the power of sin and self as described in Romans chapter six, and leading on to a walk with others in newness of life in a corporate or church fellowship. TAS had a simple but all-embracing definition of such church life: "A local church is a company of born-again Christians, brought together by the Lord in any given place, and over whom the headship of Christ is an established and operating reality." It was his emphasis on the subjective work of the cross in human lives that distinguished TAS' early messages from other 'deeper life' ministries of that period. It supplied people with a positive meaning for and inward peace about their sufferings and the sometimes painful divine disciplines that they encountered in this life. Strangely, however, this theme also alienated him from some former pastoral colleagues and men in the ministry to whom it was an unfamiliar and therefore questionable teaching on the work of Christ. This is how a pastor, one of his fellow workers at the centre, described TAS' teaching about the cross: "He preached a gospel of full salvation by simple faith in Christ's sacrifice, but he further stressed that the one who knows cleansing by the blood of Jesus should also allow the same cross to work in the depth of the soul in order to be released from self and thus find a less carnal and more spiritual walk with God. TAS himself had gone through a crisis of self-undoing by his acceptance of the cross's verdict on his old nature, and had found it to be the introduction into an altogether new enjoyment of Christ's life, an 'open heaven' as he would often say." "The cross is not only painful; it is unifying. TAS made it clear that it leads the individual believer not only into an enlarged personal enjoyment of resurrection life, but also integrates every such one into the fellowship of the Church which is Christ's body. He could never think of Christians as isolated, nor of churches as isolated groups. He always kept before him the great purpose of redemption, the incorporation of believers into vital membership of the one body." I can confirm most of these observations from my experience and add some comments on memories that still remain many decades later. I shall never forget TAS' sensitivity to Scripture. Again and again he would go over a particular exposition to ensure that the interpretations were neither imbalanced nor shallow. This high level of responsibility carried into other phases of life. You rarely caught him off guard. There was a consistently high level of commitment and sensitivity to things of the Spirit. I recall prayer meetings where perhaps only two or three were present. TAS shared a message from Scripture with the same fulness and care that he would have given to an audience of a thousand, and his prayers were as strong as they would be in a larger gathering. A friend wrote me shortly after TAS' death and in the course of his letter said this: "I feel within myself a deep and lasting indebtedness to our mutual friend, not so much for specific things he taught me as for the way he led us to the Lord Jesus, taught us to love and to follow him, and to expect a degree of closeness and fellowship that no one, up to that time, had even suggested might be possible. He made our Christian faith a way of life more than anyone else had ever done, and set us on a quest that still leads us on." That spirit of quest was always a feature of TAS' thinking. Once he likened the Christian life to that of a pioneer making his way through unmapped wilderness territory. One of his favorite hymns was George Rawson's, "We limit not the truth of God to our poor reach of mind, by notions of our day and sect, crude, partial and confined. No, let a new and better hope within our hearts be stirred," and then the refrain drawn from John Robinson's 1620 sermon to the Pilgrim Fathers, "the Lord has yet more light and truth to break forth from his word." I would be remiss if I failed to point out that TAS shared the weaknesses and experienced the failures that are common to a fallen humanity. He found it difficult to share responsibility and this often deprived him of the benefits and corrective help both of other evangelical leaders and sometimes even of his own close colleagues. He was very much aware of his own faults and many of us knew of this personal sense of unworthiness. It frequently found expression in his public prayers, especially at the conclusion of a series of devotional conference messages. In those early days of my Christian life, in the 1940s, the atmosphere in the British evangelical community was quite defensive, almost a siege mentality. As I shared my experience with other Christians, I found that new thinking was a problem to them. They wanted to stick to familiar language and well known doctrines. Today, in our postmodern society, as we enter the twenty-first century, there is an effervescence and confidence among evangelical Christians that copes more easily with new things. In his teaching, TAS was ahead of his time, so he had to live with the difficulties that are always the lot of visionaries. From the hundred or so books or booklets of TAS, I have grouped my paraphrased extracts under eight heads representing the main themes that recur again and again in his writings. To distinguish TAS' sources clearly, I have indented them in smaller type. Biblical quotations are from the New International Bible.